The booking form to be used for users who will avail of the ISOLDE group booking in 2017 can be found here. 15 rooms are held until one month before the experiment runs. The ISOLDE Newsletter for 2017 is now available here. A Mini-Workshop will take place at CERN as part of the NuPECC meeting on the morning of 10th March 2017. More details can be found via http://indico.cern.ch/event/611038/ . When the pre-registration (PRT) has been completed for a new User, it is now possible to get a CERN computer account and, hence, complete the on-line safety courses required for access to ISOLDE before coming to CERN. Once the pre-registration is accepted by the CERN Users office an email is sent to the User informing them how to apply for the account. Nuclear astrophysics is the study of nuclear-level processes that occur naturally in space. Notably, this includes understanding the chain of fusion events, or nucleosynthesis, that occurs in stars, and how can we recreate them in our facilities and compare them with the observables from space. The ISOLDE Nuclear Astrophysics School will consist of morning lectures and tutorial sessions in the afternoon. The 3rd HIE-ISOLDE cryomodule is now in its final position in the ISOLDE hall. It was transported on Tuesday the 24th of January as shown in the photo below, courtesy of E. Siesling. It was tough for the transport people due to the freezing conditions. The cryomodule is already on its jacks, the shielding tunnel roof is closed and the alignment done. An ISOLDE laboratory portrait was published as a special volume of Hyperfine Interactions: HFI 129 (2000), in 2010 a brochure about ISOLDE was produced, and in 2011 a facility article was published in Nuclear Physics News. The 2016 ISOLDE Workshop and Users meeting will be held at CERN from the 7th to 9th December. Registration for the event is now open via http://indico.cern.ch/event/561089 . 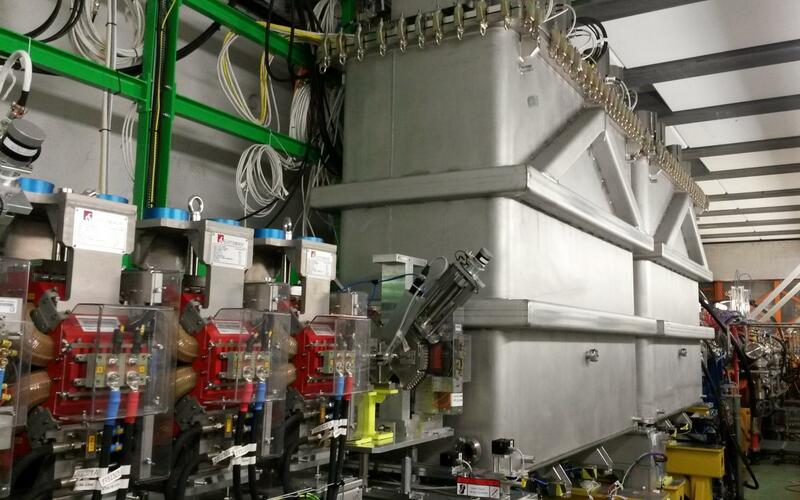 ISOLDE hosts the first two cryomodules for HIE-ISOLDE.